Delivering a comfortable, high-value, no-frills experience on some of the Bahamas’ most productive flats. Located in the settlement of Kemp’s Bay on the southeastern shore of Andros Island, Andros South Lodge fly fishes some of the most diverse, productive and least traveled waters in all of the Bahamas. If you are looking for white tablecloths and day spas, this is not your place. But if you are looking for clean and simple accommodations, skilled guides, quality equipment and a great Bahamas fly fishing program, this destination needs to be on your list. Andros South is a 20 minute drive from Congo Town in the southern portion of Andros Island. As many of the flats of South Andros are wadeable, guests have the option to depart their boat and wade for hours at a time if they wish and if conditions allow. It will sometimes occur that, once reaching a flat, your guide poles the boat for a period of time to determine the activity and presence of feeding fish. Once it’s determined that the fish are around, guests may prepare themselves for wading while the guide secures the boat. The flats fishing that follows is world-class. Day 1: Arrive Congo Town, South Andros (COX) in the afternoon. 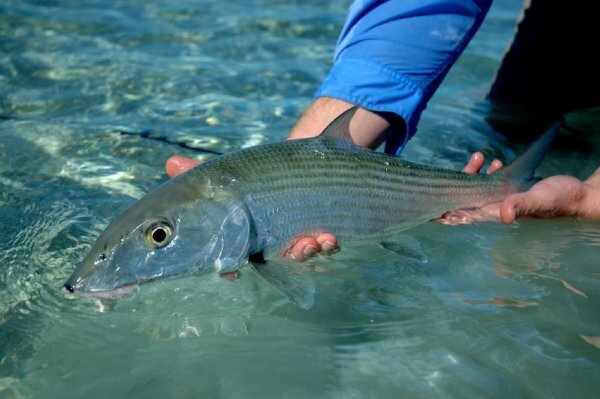 Days 2-6: Full days guided fishing on the flats of Andros. Day 7: Depart after breakfast to Congo Town, for return flights home. Rods: One #7 - #8wts (bonefish rod) One #9 or #10wt (barracuda rod/backup bonefish rod). Reels: Two large arbor saltwater reels. Floating Lines: Two floating, tropical saltwater floating lines total.